I just have to share a photo a lovely customer sent me today! 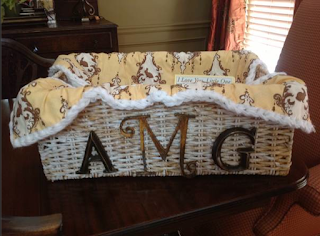 She purchased this blanket from my Etsy shop and gave it as a baby shower gift. It's a photo prop with her monogram on the front! How cute is THAT? If you are a knitter or crocheter and give your finished items as a gift, you will understand me when I say that there is nothing better than seeing it in use! A hat on a noggin, a blanket in a stroller, a shawl around someones shoulders or a scarf around the neck.....it's THE BEST!